be cut down, that it will sprout again" (Job 14:7). e decimated tree and re-sprout. 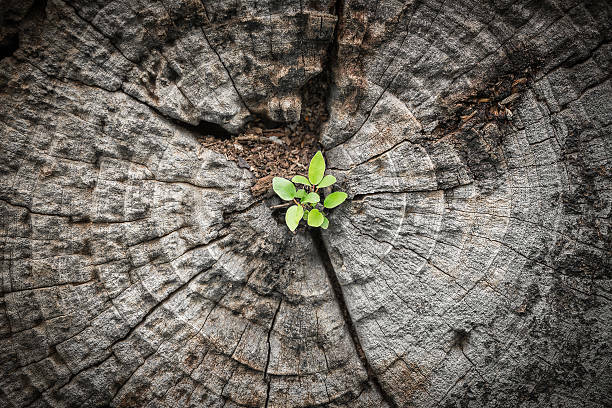 If a tree can sprout again from a stump, how much more can a man whose life may be, for the moment, cut down due to circumstances beyond his control. If he wants, and seeks The Lord as to how, he can arise from the stump of despair and be restored. We all have hope today because of one named the HOPE OF ISRAEL (Acts 28:20), Yeshua Ha Mashiach. The Apostle Paul was arrested and put in chains because he believed in this HOPE (Acts 28:20). Although repeatedly accused, he had done nothing wrong against his people or the customs of the ancestors. Many of you are suffering today because of delayed HOPE. Remember Abraham and be encouraged today. He believed in hope against hope. (Romans 4:18) God promised him that he would be the father of many nations. He was faithful, God's friend, obedient to his every command, yet suffered through years of contradiction to that word. He never lost HOPE. Israel declared: "Our bones are dried, and our HOPE is lost: we are cut off for our parts" (Ezek. 37:11). They were saying that their hope had vanished and they were destroyed. God commands Ezekiel to prophesy, "I will open your graves and cause you to come up out of your graves…" (Ezek. 37:12). Today, God is promising this to all who call on His Name. You may feel buried under confusion, disappointment or shame. God's heart is to resurrect (re-sprout) you from this condition of heart. "God can't break His Word. And because his Word cannot change, the promise is likewise unchangeable. We who have run for our very lives to God have every reason to grab the promised HOPE with both hands and never let go. It's an unbreakable spiritual lifeline, reaching past all appearances right to the very presence of God" (Heb. 6:18-19 Msg). "For there is hope of a tree, if it is cut down, that it will sprout again, and its tender branch will not cease (Job 14:7). If a tree can be restored, how much more a man.